I went to Idaho in June as part of a scooter rally held in Farragut State Park and wentfor a relaxing paddle in Lake Pend Oreille in Idaho. Conditions were superb and hot - just a little cloudy as I put in. Unfortunately people don't really watch their dogs on this beach so it's covered in doggie road apples. The launch was fairly quiet in the morning, so I parked my truck and pushed off on the beach area beside the docks. 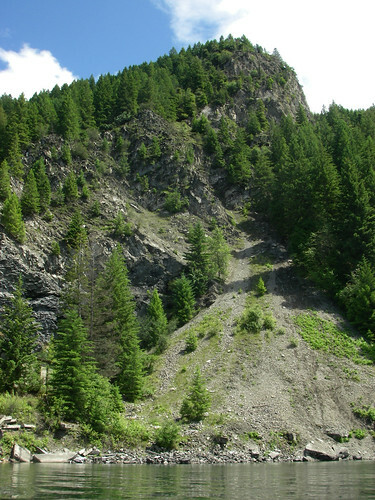 Today's adventure was to cross over to Lakeview to see a building that had tweaked my curiosity from shore. I started down the bay with my back to the mild wind and paddled to the closest end of the lake to get running along the mountainside opposite to the launch. 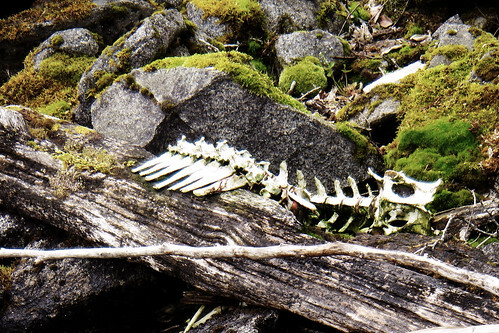 There were all kinds of neat things laying in the mossy rocks of the fjord including a skeleton of some unknown critter. What looked pretty close by eye was definitely further than expected. I paddled for about 5km watching speed boats arrive at the shore after over a minute of high speed motoring past from me. The sun began to appear through the clouds and the structure on the bottom shores of Lakeview came into focus. 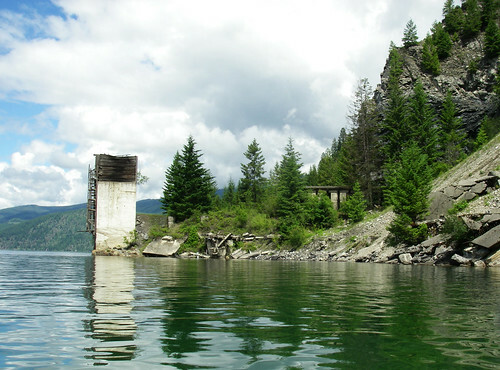 It was an old mining building that fronted on the water, obscuring numerous ruined work barracks behind it. 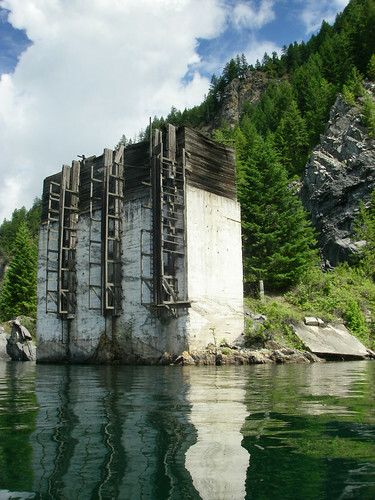 Apparently all of the mining the apparatus along the waterfront came from a number of now defunct limestone mines from as early as the 1800s.